This year the 4th of July is on Wednesday. Looking at traffic last Friday, it seems much of the country is taking a full week off. 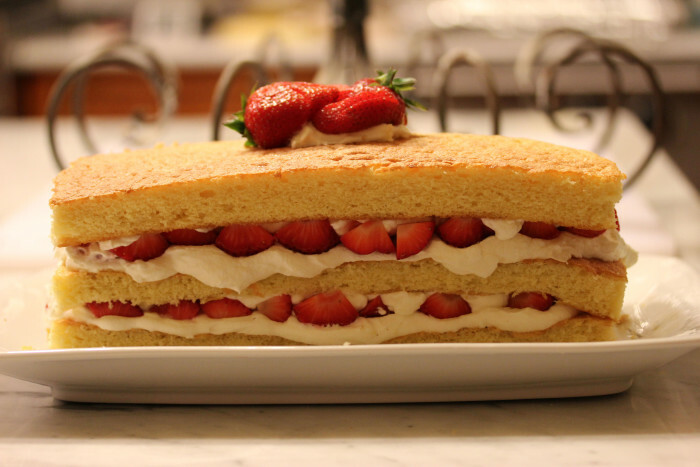 For you Wednesday dessert, he’s a recipe I’ve offered before: the ultimate strawberry and cake dessert featuring a white chocolate buttermilk cake. Want it red, white, and blue, then add in some blueberries! Suzi and I are taking the week off, too, so my blogging here will feature some different ideas. Today, we are headed to the Erie Canal. The towpath for the canal has been converted into a rail trail. No, we won’t be biking all 400 miles! But we’ll do a sample and let you know. In the meantime, if you want the best possible dessert, here it is, direct from Sherry Yard and her Desserts by the Yard masterpiece. This dessert is a spectacular 3-layer strawberry cake. A spongy buttermilk cake, made with white chocolate, is baked, then sliced into the three layers. The layers are separated by strawberries buried in a tangy mix of whipped cream and crème fraiche. As the picture here shows, this dessert is eye-stunning. The cake itself softly carries just the faintest notes of the buttermilk and white chocolate. And the filling, with little sugar, bites at your tongue and uses the sweetness of the berries to compose a full flavor palette. This dessert look beautiful, tastes perfectly, and will impress your guests. With the layers and fillings, it looks complicated — part of the reason you guests will utter an “oh, my,” when they see it. Yet it’s an easy cake to make. The time factor, about 3 hours end to end, simply comes from needing to let the cake bake, then fully cool. It’s a great project to have going while you work on other aspects of dinner. With this cake, you know your evening will end sweetly and sensationally. Ah, for the 4th of July, if you want red and white and blue, then add some blueberries for pure patriotism. Place a rack in the middle of the oven and preheat the oven to 350°F. Spray a 12 x 17″ half sheet pan with pan spray and with parchment paper. Spray the parchment. Melt white chocolate in the microwave safe bowl at50% power for about two minutes or in a heatproof bowl set over a saucepan of simmering water and set aside. Be careful, because white chocolate burns easily. In a stand mixer fitted the paddle attachment, or a large bowl a hand mixer, cream together the butter and 1 ½ cups sugar at high-speed for two minutes. Scrape down the bowl and beaters and continue to beat for three more minutes, until light and creamy. Scrape down the sides of the bowl. Whisk 2 tablespoons butter into the melted white chocolate until blended. Scrape this mixture back into the butter and beat on low speed until well blended. Add the egg yolks in two editions, scraping the bowl down after each addition. Beat in the vanilla. On low speed, alternating wet and dry ingredients, add the buttermilk and the flour mixture in four additions. Scrape down the bowl. In a large bowl, beat the egg whites on medium speed with a hand mixer until they form soft peaks. Slowly add the remaining ¼ cup sugar and continue to beat on medium speed. Beat until the egg whites form stiff, glossy peaks. Fold half the egg whites into the cake batter, then gently fold in the rest. Scrape the batter into the prepared pan. Using a spatula, preferably offset, smear the batter evenly over the pan. Bake, rotating the pan from front to back halfway through, until golden brown and firm to the touch, 25 to 30 minutes. Remove from the oven and allow to cool in the pan. Lightly spray the back of a half sheet pan with pan spray and cover with parchment. Invert the cake onto the parchment covered tray, remove the pan, and peel off the parchment. When the cake is completely cool, cut crosswise into 3 equal pieces. Whip the cream, crème fraîche, and sugar together to medium stiff peaks. Place the first piece of cake on a serving platter. Spread 2 cups of the whipped cream evenly over the top. Arrange half the strawberries on the whipped cream and then spread a little layer of the cream over the berries. Place a second cake layer on top, repeat with2 cups more cream and the remaining strawberries. Top with the last layer cake and spread the remaining cream on top. Chill until ready to serve. The cake can be assembled up to 4 hours ahead.